Overnight at Kirurumu Tented Lodge Kirurumu is off the beaten path and its tents are situated to offer maximum privacy. Enjoy first-class service while staying at this eco-lodge. Kirurumu uses solar energy for heating water and the floors of each tent were built from natural volcanic stone. Go on a bush walk outside Lake Manyara with the Kirurumu staff and learn about the natural environment as well as the history of the different ethnic tribes in the area. After breakfast, go for a morning game drive in Lake Manyara National Park. Spend approximately two hours in the park before leaving for the Serengeti. Chat with Maasai herdsmen along the way and eat a picnic lunch. Serengeti National Park, which has been declared a World Heritage Site and Biosphere Reserve, is a vast and beautiful expanse of 5,600 square miles that supports the largest concentration of plain game in the world. Famous for its gregarious procession of 1.2 million wildebeest and zebra that takes place from December to August, the Serengeti attracts thousands of visitors each year. The migration offers excellent opportunities to view animal behavior due to the abundance of both predators and prey. Common animals are wildebeest, cheetah, zebra, lion, giraffe, and many antelopes. Proceed to your private bungalow at Ndutu Lodge in the afternoon, viewing plains animals along the way. Ndutu Lodge is situated in a beautiful acacia woodland, offering opportunities to unwind to the sounds of Africa while enjoying the sunset from the open-air sitting areas and dining room. Spend all of day three in Serengeti National Park viewing animals such as hippo, cape buffalo, giraffe, cheetah and lion. The Serengeti region encompasses Serengeti National Park itself, the Ngorongoro Conservation Area, Maswa Game Reserve, the Loliondo, Grumeti and Ikorongo Controlled Areas and the Maasai Mara National Reserve in Kenya. Journey to pools and less well-traveled areas of the Serengeti. On day three, proceed to Kirawira Camp in the Western Serengeti. The permanent tented camp, known to be one of the most luxurious lodges in the Serengeti, is located near the Grumeti River. The tented camp is situated directly in the path of the wildebeest migration, and, during certain times of the year, visitors do not even need to leave the camp to see hundreds of animals. Kirawira also has a pool that offers a chance to cool off after a long day on safari. Spend all of day four exploring the Serengeti. After an early breakfast, drive to Grumet River to spend time watching bird and water life. We will have the opportunity to view crocodiles and may be lucky enough to see a crocodile hunt a wildebeest. Return to Kirawira Camp for dinner and overnight. Spend the morning in the Serengeti. After a picnic lunch, proceed to Ngorongoro Crater. Well make sure to get you to the crater rim Serena Lodge in time for the spectacular sunset. Ngorongoro Serena Lodge overlooks the crater and offers breathtaking views from its rooms and sitting areas. Enjoy your picnic lunch on the crater floor where Black Kites feed on tourists' leftovers. Lunch offers an excellent opportunity to view the behavior of birds and observe the forest elephants that usually feed in the marsh near the picnic area. After lunch, continue on a game drive to spot the most elusive of the Big Five, rhinoceros and leopard. Overnight at Ngorongoro Serena Lodge. After breakfast, drive to Tarangire to discover the giant termite mounds and baobab trees of Tarangire. This park, which is home to thousands of elephant, sports a particularly dense wildlife population between June and October. In the dry season, game congregates along the river having migrated from the Maasai Mara. The vegetation of this park consists of open acacia woodland dotted with many baobab trees. Tarangire is an ornithologists paradise, offering an incredible diversity of avifauna. Overnight at Tarangire Tented Camp, enjoying the privacy of the secluded camp. Spend all of day eight in Tarangire following elephants and lions. Leave the park in the late afternoon for Arusha. Pass by shops to purchase souvenirs on the way back to Arusha. Dinner and overnight in Arusha at Kigongoni Lodge. Leave on the morning flight to Zanzibar. Arrive in Stone town around noon. Buffalo Tours staff will meet you at the airport to transfer you to Matemwe Bungalows. Enjoy a relaxing afternoon on the beach followed by a delicious seafood dinner. Spend all of day ten on the beach. Organize a diving lesson with the hotel or visit an offshore island. Matemwe is one of the best locations in Zanzibar for diving, and many species of colorful fish can be seen during diving or shallow water snorkeling trips. Return to the bungalow for dinner and overnight. Spend the morning and early afternoon at Matemwe soaking in the sun. During the early evening, transfer back to Stone town for a final night on the town. Visit the lively outdoor fish barbecue, or take an Arabic architecture tour. 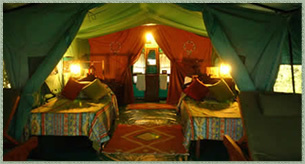 Spend the night at the Stone town Serena Lodge. During the morning, go on a spice tour or town tour. Return to the hotel to collect your belongings before boarding an early afternoon flight to return to Kilimanjaro Airport. Say goodbye to Buffalo Tourss Zanzibar and Arusha staff before leaving Tanzania on your evening flight.